May 25, 2015, c. Leeham Co. Friday we showed our little video from our test flight of Airbus A350 at end of April. Now it is time to describe the impressions during the flight more in detail. Different from the excellent reports of other magazines that were present, we will look deeper into flying an aircraft with Fly By Wire in contrast to a conventionally controlled aircraft and less in trying to compare the A350 with other airliners, as we don’t have this experience. Our lack of experience in flying airliners has an advantage when it comes to first impression of how it is to fly the much-discussed Airbus Fly By Wire (FBW) concept. My experience so far has all been non-FBW aircraft, from very small and slow (Tiger Moth) to the fast and a bit larger (Mach 1.7 SAAB Draken). In all, I’ve flown 14 different types. To that, one can add having flown the Embraer KC-390 simulator last October. Some of the aircraft have had no servos. Others had 100% servos with artificial feel through springs working on the stick. Autopilots have differed widely from wings leveler to flight director aircraft with coupled ILS approaches. None has had auto-thrust to date except for the KC-390. My primary interest with flying an aircraft like the A350 is to get a feel for how natural such an aircraft is to fly for someone coming from conventional aircraft. The Airbus is controlled in a way which is easiest described as being in constant autopilot attitude hold mode. When no input is given on the stick, the aircraft keeps its attitude. This is also true when the speed varies. A conventional aircraft would lower the nose when speed decays and start the slow rollercoaster called phugoid oscillation. Not so the Airbus. It stays put until one commands otherwise. Coming totally green to this environment gives one a possibility to see how easy it is to adapt to such an aircraft when having basic flying skills and having learned the aircraft’s automation systems using a desktop simulator based on the first FBW aircraft that Airbus made, the A320. The ease of adaptation from having trained on an A320 also tests Airbus claim of commonality between types. Fly by Wire (FBW) can mean just that: the aircraft rudders (we will use the word rudders in a general sense to characterize all the aircraft’s movable control surfaces) are controlled via electrical signaling instead of via steal wires or aluminum push-rods. This is called open loop FBW and an example is Embraer E-Jet in its first generation. In such aircraft, the commands from the flying controls are transferred to the rudders via electrical signals and there might be computers that modify the signal dependent on, for instance, the speed of the aircraft (control gain adaptation), but there is no comparison of the given command and the aircraft’s response by the computers. This is for the pilot to do. The Airbus FBW is of the more advanced type, meaning the pilot gives a command, the FBW computers interpret what the pilot wants to have done and then executes one or several commands to different rudders to get the job done. The latter system has several advantages; it leaves the field free for the flight law designers to use several rudders to achieve a desired effect, like having an aerodynamically different aircraft like the A350 fly like an A330 from a pilot’s point of view. We were delayed in the simulator before our afternoon A350 flight and as a result I went to the flight test center with Airbus Cheif test pilot Peter Chandler in his car, instead of the bus which was chartered for the media teams. We spoke in quite some detail about the flight testing of the A350, something that I had followed very carefully over the years from the sidelines. Contrary to other Airbus aircraft programs, there were virtually no problems to fix in the A350 flight test. I have verified this from several sources, including several A350 test pilots at different occasions, so this was not Chandler giving a party-line pitch. Instead, the test flights, on top of flying for certification credits and verifying flight performance, were used to fine tune the flight laws of the aircraft. Target was to make the A350 feel like an A330 but to achieve an even more refined aircraft. Chandler described that this could require many flights and much discussion with flight control people to achieve a rather straight-forward function like putting the nose wheel down after landing. This shall be done in a positive yet smooth way. Different test pilots have different styles in doing this. Some gently lower the nose, others let it fall and then give a last moment pitch up to hinder it from slamming down onto the runaway. The fine-tuning was aimed at allowing the different pilot styles all achieving a smooth nose wheel put down. Another area that took a lot of testing was the fine-tuning of the droopable spoilers so that they generated an aerodynamically correct slat to the A350 drop hinge flaps, yet did not produce a strong whining sound. An adjustment of a fraction of a degree of the spoiler gap could do the trick and it took many tests before the different teams (areo, flight laws, test pilots, flight test engineers) were satisfied. We also discussed what control law adjustments had been made during development. I have a special interest for aircraft stability and control and have taken special courses in the discipline, among others at Cranfield College’s aeronautical university, including flying in their specially equipped Jetstream 31 test aircraft. With this aircraft, all the different modes of aircraft oscillations could be studied, fun rides with puke bags handy for those in the rear test stations when testing dutch roll for long. Dutch Roll: Comes from the Dutch ice skaters skating their canals in the winter in their typical hands-on-the-back style, ducking and diving the fore-body to the left and right in a rhythmic fashion to keep balance. An aircraft which has strong roll resistance (strong dihedral) and is weaker in yaw can go into the same ducking and diving mode to the dis-pleasure of its passengers. Aircraft designers fit yaw dampers to stop dutch roll tendencies. Traditionally, aircraft designers have worked on the flight laws in a rather straight-forward way. This means: to improve pitch handling when, e.g., the aircraft aerodynamics change so that the aircraft goes nose heavy when, e.g., flaps are extend. This has been compensated with autotrim during flap travel so that the pilot does not have to do the trim change. With FBW and especially with the powerful A350 FBW, the flight control people have used more features of the flight control system than just trim to achieve an experience of no trim change but also no real flight feeling change. This can involve setting autotrim, changing pitch gain, adjusting flap and slat deployment speeds and values dynamically, changing damping values in pitch, roll or yaw axis, all to leave the pilot with a desired experience, making his flying more instinctive and easier. Chandler answered several of my questions with, “they adjusted a lot of things, not just one parameter, can’t tell you all they adjusted” to get the desired characteristic for, for instance, landing flare. This shows just the amount of detail work that went into the flying experience of the A350 and also to the A350 cockpit in general. So how does it all work then? Having read a lot of on-line discussions around the “computer game style flying of Airbus FBW aircraft,” I was quite excited to be given a chance to test this it myself and see if this was the case. The discussion comes from the fact that the Airbus cockpit uses a side-placed spring loaded joystick as control stick together with throttles which are not of the back-driven type, Figure 1. Figure 1. Airbus A350 cockpit with sidesticks and throttles circled. Source: Airbus. 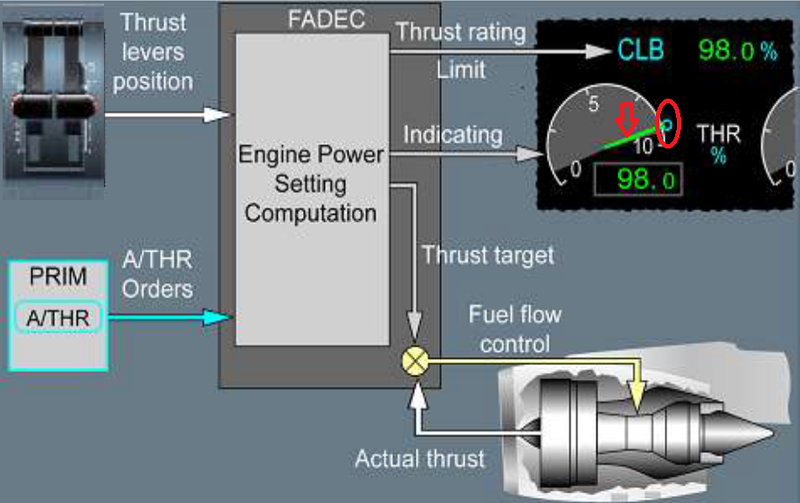 This means they are used to tell the engine control computers, the FADEC, what job one want to have done (e.g., give me climb thrust) rather than controlling it oneself, Figure 2. Figure 2. A350 thrust setting via FADEC. Circle shows lever position bug (blue circle) and FADEC thrust (green line). Source: Airbus. When the FADEC then changes the thrust to comply with different changing conditions the throttles don’t move in unison, they stay in their detent. In flying jargon, this is called that the throttles are not back-driven. In other words, when Autothrust reduces engine rpm to lower thrust, the throttles does not move to reflect the fact that the engines have less demand for power generation placed on them. It means that one always looks at the engine display to understand how much thrust the engines generate and that one sometimes needs to collect the power level green line with the lever position bug before disengaging Autothrust to avoid sudden thrust swings. In normal operation this is no problem, when stressed this can be a bit harder. Before we get to deep into the throttles, let’s start with the control of the aircraft. I am a typical right hand stick and left hand throttle guy from my fighter days. Classical Civil aircraft including airliners are flown either like that from the First Officers seat (FO) or left hand yoke and right hand throttle if in the Captains seat (CO). I deliberately choose the FO side in the simulator to keep this as I am used to, but in the aircraft, all media pilots wanted the Captain’s position so I flew there as well. It meant I flew the aircraft with my left hand, which I seldom have used for this and was controlling throttles and thrust reverse with the right hand. Despite this I sensed nothing of the rumored artificial feel when flying the aircraft through the joystick. The response of the aircraft was immediate and solid. Gradually I stopped moving the joystick for small adjustments. I just gave it a bit of pressure and the aircraft followed. It was a nice feel and it gave me confidence in the aircraft. This did not change with the different flight modes and protections we tried. Whether it was high speed gradual pitch-up to stop a rather brutal attack on the high speed limit, Vmo, or low speed protection preventing me from stalling the aircraft, it was always smooth and natural in its operation, Figure 3. Figure 3. 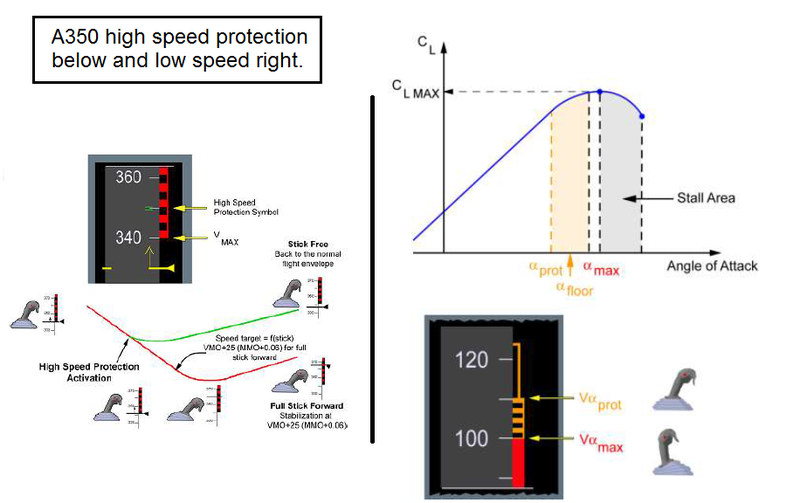 Airbus high and low speed protections. Source: Airbus. With normal mode FBW, turning is done in a normal way until 33° bank. You put the aircraft in the roll attitude and then the FBW keeps it there, including keeping altitude. To roll over 33° requires constant stick pressure and one cannot bank more than 67°. For a fighter pilot this sounds weird (you seldom bank less than 60° in a fighter except for ATC procedure flying; it just makes your turn radius too large at M 0.9), but it feels quite OK flying the A350. This is a passenger aircraft and you would not bank over 30° for anything else than an abnormal situation and then keeping the stick pressure on is OK. Like fighters, there is no kicking rudder when turning. What little aileron adverse yaw there is, the FBW takes care of. It also applies pitch to keep the altitude in the normal turn. During the low speed handling, I could experience a simulated engine out direct after rotation. We slowed to a speed close to V2 and Chandler pulled one engine to idle and told me to not compensate in any way. There was a little yaw and a slight roll because of the yaw but it was nothing compared to the twins I trained on in previous flying. Miss the rudder and leaning into the going engine, and you are in serious trouble for many of these aircraft. Here an engine out after take-off is almost a non-event in comparison. After high speed and low speed handling and checks, Chandler switched the FBW to direct law. Now the aircraft is flown with no protections and no FBW compensations. I sampled direct law in low speed mode, around 180 kts. I was surprised by how little different the feel was. Yes, you had to kick rudder in the turns and apply pitch as for a conventional aircraft, but the responsive feel was still there. We changed thrust and there was some pitch change and asymmetric thrust called for rudder input, but it was still a nice and well behaved aircraft. When people discuss that Airbus pilots were reverted to alternate, or even worse, to direct law it is like things are starting to go pear shaped. Not at all. You are now with an aircraft that flies like every other aircraft on the planet and they don’t fall out of the sky. The FBW allows Airbus to tune the feel of their aircraft families to enable common type ratings. This eases pilot training and deployment for the airlines. The Airbus FBW also has very sensible protections, both for high and low speeds. When things don’t work as normal one is down to a classical aircraft in functionality, should not be to dramatic should it? The stick control was a positive surprise. The throttles takes some getting used to. They are in a way two personalities in one. 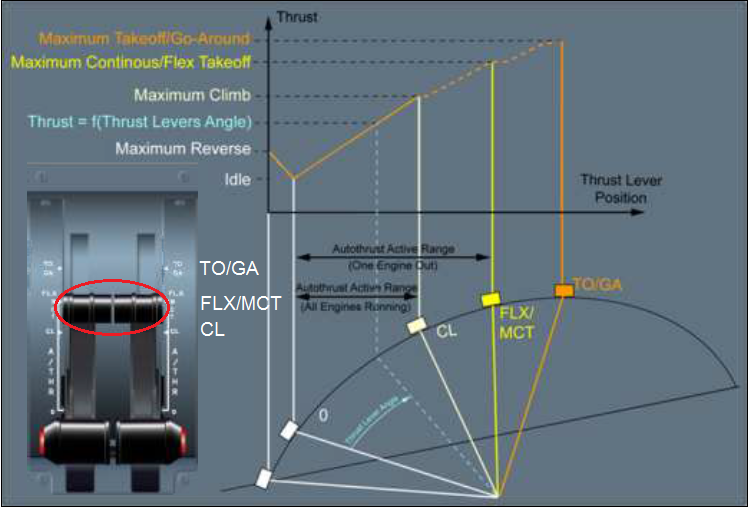 Move the throttles in a normal way and the engines follows in a nice way from Idle to full thrust which is called TO/GA (Take Off / Go Around thrust), Figure 4. Figure 4. A350 throttle operation. Annotations added as the picture resolution was not perfect. Source: Airbus. When you go for a normal take-off you typically work in Autothrust mode and move them first to FLX/MCT (Flexible take-off thrust with different forms of engine derate to save engine maintenance or when in the air Maxium Continous when you fly on one engine), then after you are established on your climb-out to the Climb detent. Once you have handed over the engines to the automation the levers don’t move any more, you can only see the present thrust level on the engine display. If your flight follows your flight plan that you have programmed in the Flight Management System, FMS, your throttles stays in CL detent until you flare for landing given you do an autopilot/autothrust controlled approach and landing. This is perfectly OK and natural for normal flying but was really awkward on Airbus aircraft up to A350 when some protections changed the thrust drastically from e.g. manual 65% to automatic and full throttle, i.e 100%. Before you could get the thrust back to your control when out of the protection you had to sync the throttles with actual thrust, here how it worked. In previous Airbus FBW aircraft, including the simulators I trained on (A320, 330), a triggered protection meant the engines went to full power (TO/GA) and stayed there until a mentaly stressed pilot (he shouldn’t fly into a protection otherwise) realized he had to sync the thrust levers and its blue bug with the thrust level green line before being able to cancel Autothrust (with the red “Instinctive” Autothrust disconnect button on the throttle handles side) and get thrust functionality back to normal. If his happens in, e.g., full landing config (which is the most probable situation), one easily goes from an under speed situation to a flap and gear over-speed, simply because one can’t perform the catching of the thrust green line with the throttle levers blue bug fast enough. Airbus has recognized this and changed it for A350, Full thrust is applied to get out of the low speed situation but then the throttles return to normal state when the protection deactivates. This felt good and is a clear improvement, with this the major Airbus throttle grievance disappeared for me. Another area which has been improved is how thrust reverse is controlled, it is now with levers on the front of the throttles like most other aircraft instead of moving the throttles behind the idle detent. Worked flawless in my life’s first thrust reverse after landing the A350. In the next article about Flying the Airbus A350 we will look at some of the new system concepts that was introduced on A350 and how they differ from previous generations. Aircraft, like cars, leave a feel imprint in one’s mind after flying/driving them. I flew business aircraft after my Air Force time but stopped after a while as it was no fun. It left no lasting desire to fly, having done the real thing with the fighters. The A350 rekindled my joy of flying. The feeling of the aircraft was such that it was fun to fly. That feeling stayed for several days after the test flight. A very nice feeling and I am working on flying more of this breed of aircraft. Flying this class of aircraft is fun, especially when they are so well put together and tuned as the A350. Very nice experience. Congratulations, Björn. Is it real that you could “lose” your airmanship if you just use the autopilot? Perhaps many pilots are just not having fun, and are letting it in the full auto-mode all time? You don’t lose it because of flying autopilot, it has many positive consequences. You get mental capacity over to understand the situation in the air in densely trafficated air-spaces, this improves your situaitional awareness. What you mean is if seldom flying manually can deteriorate your airmanship, definitely. There is a lot of focus on this now and it is needed. My special worry is that a lot of autopilot flying and thereby oversight slowly changes the way you scan the instruments. Traditionally one learns to go: Artificial Horizon, then one value like altitude, then back to the horizon, then next value which can be speed, then horizon and then next value and so on. Lets call it the T scan. One also learns to always do the correction on the horizon, not when you see a value out of range. This is what you learn in training and in the tough flying in the airforce you learned this is the right way, your life depends on it. Autopilot flying and surveying causes you to skip the artificial horizon, there is nothing happening there and your scanning focuses instead on values. You need constant training to keep the correct T scan alive, otherwise you have the wrong handling pattern when you suddenly need it the most when things get tight and you need fast and correct action. This is what the current debate is focusing on and rightly so. Maybe, just maybe, all flying personel should continue with gliding – GA flying as a potencial way to keep focused. Of the several accounts of disasters that almost happened, many pilots were avid gliders. And you know that gliding is perhaps the most dimanding in terms of perpetual “feeling” and making best decisions. Not being a pilot myself, but with many family members in the air industry and one who went down in a crash, and being a passanger since my 21st day, I’m fascinated how technology has evolved, but also very sad that several of the highest toll crashes lately seems to happen during what is supposed to be the “safest” part of the flying pattern. May be boredom is one of the issues here? IMU you need a specific mindset to benefit from this freedom. The reason why the majority of drivers using cars with automatic gearboxes appear to be low quality. A stick shift and the demand for having to change gears would force the lazy to pay more attention to what lies ahead on the road ( just for changing gears but the added bonus would be a better perception for the traffic ahead.). I realliy appreciate this even if few comments. From a tehcial perspective I have learned more about how the Airbus FBW system works in one short article than I have in all the years I read Av Week. the other writes did not explain exactly what was going on and that’s obviously the relevant part of the system ops. I look forward to the 787 comparison. I believe Boeing uses the moving throttles and I think I would prefer that aspect. I give Airbus credit that I believe their auto throttles don’t just quit when you shift modes (they may at some point but more a deliberate auto throttle disconnect if I have it right). 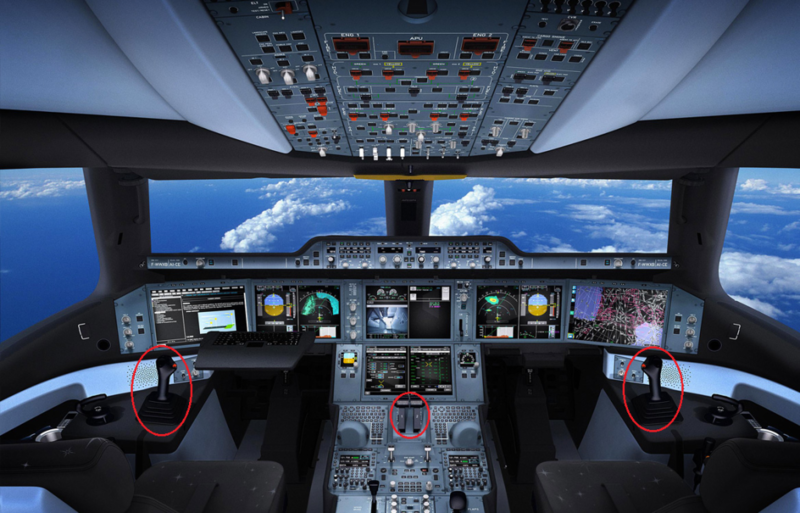 Per the 777 Asiana crash, bad piloting that could have been saved by an auto throttle save as they did not really intend to turn it off, it was turned off as a result of a mode shift and that’s harder to track. NTSB does not like Boeings approach in that regard. Back to do you design the system for your best pilots or your worst? Gotten off track but I think the regulators need to step in and make mandatory the best practices of Airbus and Boeing so that at least the critical systems work logically and the same.